HOUSTON – Six former Continental Airlines pilots who now work for the merged United Airlines have filed a class-action lawsuit against their own union today based on claims their seniority was unfairly stripped when the two airlines merged in 2010. The lawsuit accuses the Air Line Pilots Association, International (ALPA) of breaching its duty of fair representation to the former Continental pilots by stripping their seniority in favor of a larger group of pilots who worked for United before the merger. For pilots, seniority controls pay, rank, schedule, flight routes, types of aircraft flown, and job security in recession layoffs. The lawsuit says ALPA sacrificed member interests to pursue its controversial goal of achieving monopoly status as the only union available to every airline pilot in North America. The former Continental pilots say ALPA favored the United pilots because there were more of them and because the United pilots had enough votes to switch to a different union if they didn’t get their way. In 2005, ALPA lost many of its members when U.S. Airways and America West merged. In that merger, ALPA provided favorable seniority for America West pilots only to see the larger group of U.S. Airways pilots lead the switch to a new union. “This union had been burned once before and, instead of seeking a fair resolution for all its members, it ignored its duty to be fair by repeatedly poisoning the process simply to favor the side with more political clout. This caused enormous loss to the former Continental pilots,” says Adam Milasincic, an attorney in Houston’s Ahmad, Zavitsanos, Anaipakos, Alavi & Mensing, or AZA who is representing the former Continental pilots with firm partner Joseph Ahmad and Houston attorney Howard Dulmage of The Law Offices of Howard T. Dulmage, PLLC. After the merger of Continental and United, ALPA sponsored arbitration to combine the airlines’ pilot seniority lists. The lawsuit says ALPA skewed the arbitration’s result in numerous ways, such as assisting the United pilots with discovery, and even paying a witness to appear for the United pilots. The lawsuit cites the union’s adoption of a seniority formula that favored the United pilots over their peers at Continental, including using factually incorrect information to further skew the seniority results, which caused the former Continental pilots to lose years – and in some cases decades – of seniority. As a result, the former Continental pilots are asking a federal judge to scrap the arbitration results and order ALPA to restart the process of combining the airlines’ pilot seniority lists with no favoritism toward pilots who worked for United before the merger. The lawsuit is Michael Carr; Gregory Kathan; Kelly L’Roy; Perry Meier; Charles Mulhall; and Scott Mund, on behalf of themselves and all other similarly situated v. Air Line Pilots Association, International, No. 4:14-cv-00451, in the U.S. District Court for the Southern District of Texas. The web site www.LegacyCALPilots.com has been established to track the lawsuit’s progress. Ahmad, Zavitsanos, Anaipakos, Alavi & Mensing P.C., or AZA, is a Houston-based law firm that is home to true courtroom lawyers with a formidable track record in complex commercial litigation, including energy, intellectual property, securities fraud, construction and business dispute cases. AZA is recognized by Chambers USA 2014 as among the best in Texas commercial law and by U.S. News & World Report and The Best Lawyers in America as one of the country’s best commercial litigation firms in the 2014 listing of the nation’s leading law firms. 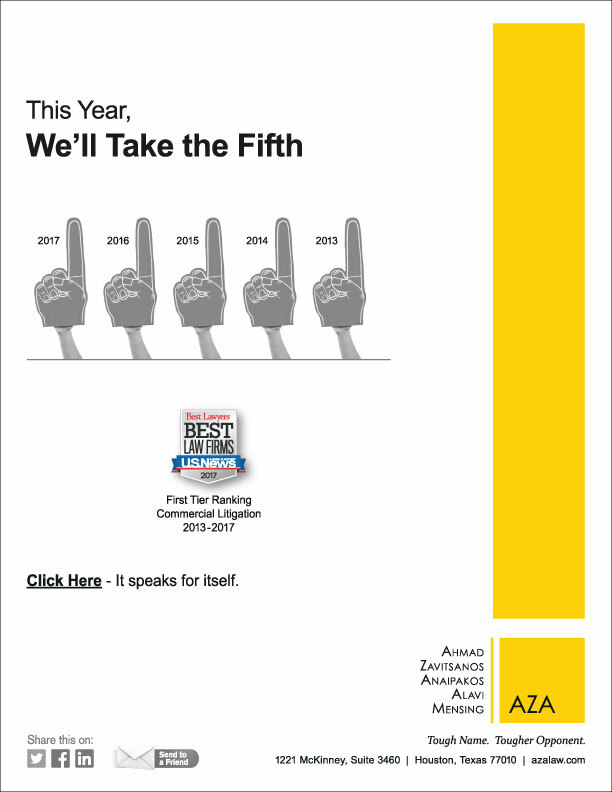 National corporate counsel named AZA one of the country’s best in client service among law firms serving the Fortune 1000. AZA has been hired on many occasions by the same companies the firm has prevailed against at trial. Read more at https://azalaw.com.